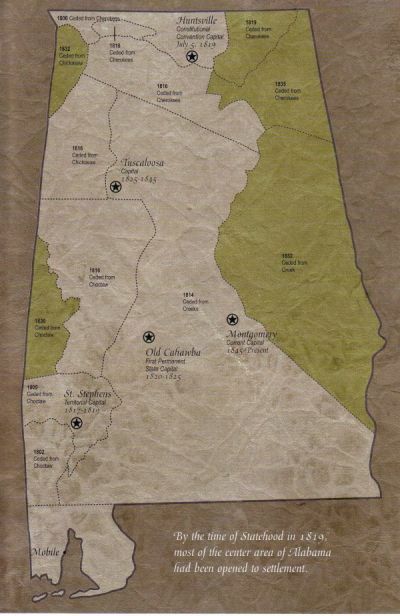 By the time of statehood in 1819, most of the center of Alabama had been opened to settlement through various concessions made by Creeks in the central portions of the state, Cherokee in the north and Chickasaw and Crucial in the west and south. The movement of settlers from Tennessee filled Alabama’s Tennessee Valley while on the Gulf Coast, Mobile served as a primary conduit for settlers wishing to occupy lands in the south of the newly-formed state. The majority of actions in and around Cahawba came from the East on the Federal Road.